So we finally got around to trying the Super Stout made way back in May! Unfortunately there was a bit of an accident during the bottling process when Mikey poured some of the beer, not only spilling some but also aerating it. We were fearful that this would affect the taste somewhat, and it did a little bit, but oh well! This beer also spent more than a month in the fermenter as Mikey tried to get as much fermentation out of the brew as possible after experimenting fermenting at a lower temperature. Anyway, the beer poured nice and black like it should, but unfortunately there was really much head to it. I was hoping for a nice stouty head, but it just wasn’t there. Let’s put that down to the aeration problem. The aroma was pretty good, but once again not all in all stouty. Quite fruity with peaches and flowers in the nose, and, of course, a bit of licorice once things warmed up a bit. Along with the licorice was chocolate, which went with well! I would have liked to see a bit of spice in there, as it’s what I like in a stout, but instead there was a bit of a sticky and sweet smell, which may be coming from the fermentation problems Mikey had. Once drinking the beer, there wasn’t quite as much body as would be expected in a stout, especially something called a “super stout.” It was thicker and fuller than paler beers, but not enough for a stout. The lack of body meant that there was little in the front, but the licorice came through in the middle which was great. This licorice thickened things up a bit, and a really nice flavour to have. The beer ended with a nice sweet and sour. Some of the sweetness seemed like a mistake and slightly out of place. Once again, probably a problem with the fermentation and the aeration. To get more stouty goodness, this beer simply needed to be maltier and to be thickened up. This beer has potential, especially because of the licorice flavour. All that being said, the lightness makes this an easy drinking beer that can be sessioned on with no problems. Agree that the body is way too weak for a stout, let alone a ‘Super Stout’. Flavour wise, I think it’s pretty close to what it should be. 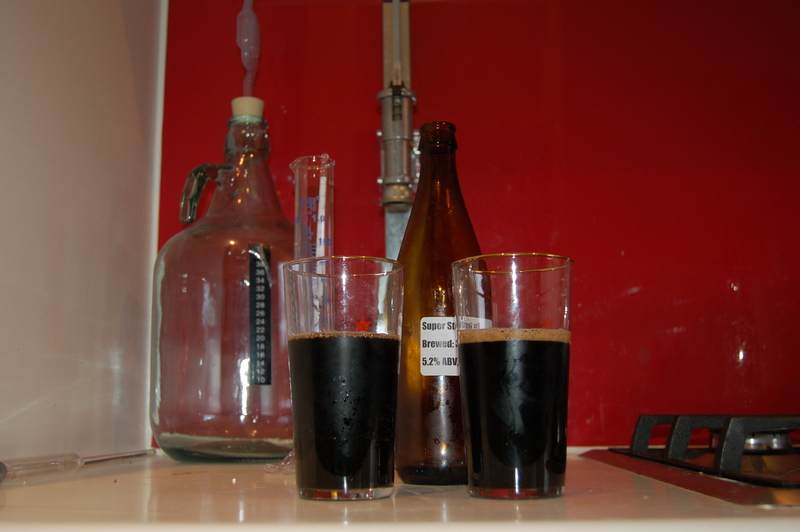 The slight sweetness works well once the beer warms up to 10+ Celsius and the liquorice comes out more. If doing this again would put a lot more malt in here. Grain is a must do, even if it’s only steeping grains.